Best Raspados | Los Pollos Raspados | ¡Comida! 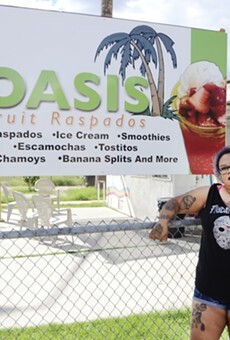 Raspados are shave-ice treats with syrup—and, no, they're not like a sno-cone! The syrups are naturally flavored and colored, and the ice is shaved and fluffy, not granular and pebbly. From that simple start, things get infinitely more complicated. You get to compose your own combination of flavors and textures, like the way an expert bartender would concoct a chi-chi cocktail. The syrups come in dreamy flavors: pineapple, pecan and tamarind are just a few. 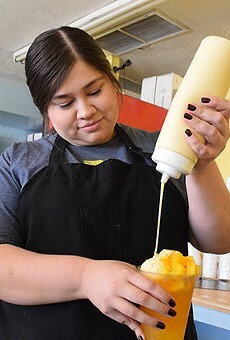 You can add in a scoop of ice cream, a dollop of lechera (sweetened condensed milk), a couple of saladitos (those salty-sour-chile plums that only native Tucsonans love) or some chopped mango or strawberries.